There is one thing each year that makes me think that buying brightly colored summer pieces in January is the best idea. That one thing is the Lilly Pulitzer After Party Sale and can make gloomy, cold January days a bit more fun! I recently discovered that the sale will be kicking off Thursday January 5th at 8am EST! The sale will last until Friday January 6th at 1pm so shopping time will be limited further encouraging you to bring you A-game. Since you'll need your A-game I'm going to be serve as your coach and go through all the plays and strategies you need to know to come out with a W. But first we need to know what we are up against (clearly I've been watching too many bowl games). Lilly Pulitzer rarely puts items on sale online aside from their two big sales of the year! These sales are highly anticipated by Lilly lovers and happen in January and August. During these sales tons of items from past seasons or promotions are marked down significantly so it's a great time to stock up! In the winter especially, I feel like the sale is a great time to buy items suitable for spring break and summer! Now that you're excited for tomorrow's sale (by now I hope your alarm is set) I thought I 'd share some tips to help ensure it's as successful for you as possible. Having shopped the sale since high school I've had some experience with how it goes although some changes have been made over the year. 1. Create an account and update your information before the sale starts. If you're even considering shopping the sale this is not a suggestion but almost a requirement. Being logged into your account and having updated information before the sale begins will allow you to check out right away hopefully helping you snag more items you're dying to have. If you don't already have an account you can create one here and you can log in here. 2. Get to the site before the sale begins. I constantly like being early to things and this sale is no different. While the sale doesn't officially begin until 8 am EST getting there early will hopefully help you to be one of the first people in line. 3. If there's something you love be sure to buy it right away. Items in your cart are not reserved. I can not stress this enough. If you find that one item you hoped would be included in the sale and it's in your size don't waste your time seeing what else you can get. GO AHEAD AND CHECK OUT! While it would be nice for items in your cart to be reserved it's likely that Lilly lovers wouldn't leave their computers all day since they'd be scrolling through the sale pages to make sure they don't miss anything. 4. Once in the virtual line do not refresh your page. 5. Have favorites in mind and have an idea of your size. Knowing what you want or if there is a realm in which your closet is lacking will help you to avoid going too overboard during the sale. Additionally, make sure you're buying things in your size unless you love an item enough to go to the trouble of getting it altered. 6. If the site crashes try shopping from the Lilly Pulitzer app. Because of how many people shop this sale it's not uncommon for the site to crash. If that's the case be patient but also consider trying to shop from the Lilly Pulitzer app. It is definitely easier to shop from the website but if all else fails the app is a good option to have. If the site does crash be polite. The Lilly team wants the sale to go as smooth as possible so harassing them with disappointed tweets isn't helpful. It's just a sale and should be fun! For more information about the sale Lilly Pulitzer has a whole FAQ page that is also helpful! And remember that shipping is free during the sale so checking out more than once is encouraged and won't cost you any extra money. One of my personal favorite parts of the After Party Sale each year is hosting a fun giveaway for y'all! 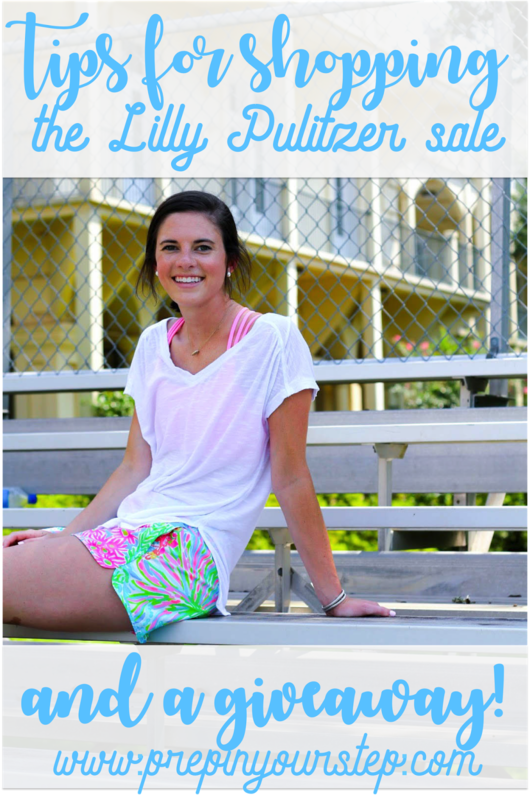 This year I came up with some really cute items that any Lilly lover would surely love! I've tried to make entering the giveaway as easy as possible and hope that the items would be useful now and well into the months when you finally get to wear your sale items. 1. Go to Lilly Pulitzer's website and tell me which print of these PJ pants you'd want to receive (see the possibilities here). 2. Follow me on instagram (@prepinyourstep). 3. Leave one comment on this blog post informing me of which print of the pajamas you'd like, your instagram name, AND your email address (I'll be emailing the giveaway winner directly when the giveaway closes on the 7th so be sure to put an email address you check regularly). *If you want to feel free to like my Facebook page as well since I am hoping to use it more this coming year! Giveaway closes on January 7th at midnight. I so wish that you could all win, but hopefully you'll score some steals from the sale! I can't wait to read through your comments to see which pajamas pants you'd choose and I hope you'll stop back by tomorrow to let me know if you've purchased anything! What a fun giveaway! The Multi Palm Beach Coral ones are my favorites! They are so cute and I love how Lilly finally tapped into the pajama market! This giveaway is awesome! :) In the PJs, my favorite print is the Sparkling Blue Fan-tastic! My Instagram is devon_foster and my email is dfostt13@aol.com! I love your blog! I'm so excited for this giveaway it looks like so much fun! I think my favorite pattern is the Sparkling Blue Fan-Tastic. I already follow you on Insta, it's always so bright and cheerful! I'm also a KD, so AOT! Such a great giveaway - thank you for the opportunity! I love the Shell of A Time print for the pajamas. I was following on insta but my handle is cd_brown, and email is cdarlin5@gmail.com. Good luck with the sale! So excited about this giveaway!! I've been following your blog and your YouTube for awhile now and I am so excited about your vlogs and the content coming up for this year on the blog. I love the "Sparkling Blue Fan-tastic" pajama pants! My instagram is @elainamell and my email is mellelaina@gmail.com!! Thanks! Love this giveaway! My favorite in the pajama pants is the "Sparking Blue Fan-tastic." My instagram is @kaitlynross617 and my email is rossgirl1995@yahoo.com. Thanks! fantastic giveaway, love all the prints, but multi palm beach coral is my fave print. Love this giveaway, such cute items!! My favorite print is multi palm beach coral. Love all the precious things in this giveaway! My instagram handle is @marykatherinescott and my favorite print in the pj pants is "Multi Palm Beach Coral"! My email is marykscott@tamu.edu! So excited for the sale!! My favorite PJ pant print (oo alliteration ;-) ) is Sparkling Blue Fan-tastic. My IG is sarah_strongg and my email is sarah.strong38@gmail.com!! My favourite prints is Multi Shell Of A Time! This is such a fun giveaway. I would love the sparkling blue fan-tastic! Thank you! and I am wishing you all the best for your final semester. I am dying over the shell of a time print! The Sparking blue fantastic are hands down my favorite! The sparkling blue fan-tastic pants are just adorable! I've had my eye on them for a bit. Thank you so much for putting this amazing giveaway on! The Sparkling Blue Fan-tastic print is my favorite! You're amazing for doing this. I love your blog and it has inspired me to make my own! Thank you for hosting this giveaway they are always so so funn!! The print I love in the pj pants are sparkling blue fan-tacstic they match my personality so well!! I've been a big fan of your blog and lilly pulitzer for a long time now. I'm really liking the Sparkling Blue Fan-tastic pants right now. Such a cute pattern. Thanks for putting this giveaway on and for giving tips for the sale. Alarm is set! I'm a huge fan of your blog. I'm also an Elemenytary Education major and I love reading about your tips and experiences! I would love to cozy up in the Sparkling Blue Fan-Tastic pj pants! Palm Beach Coral is lovely! Thanks for letting us into your life via the blog. It's been fun (that sounds 1000x times creepier than I meant it to). Multi palm beach coral is my favorite! I love your blog, Dorothy! This giveaway is so cool! I love the sparking blue fan-tastic pj pants and I'm so excited for the sale tomorrow! Can't wait for the sale tomorrow! I love the Sparkling Blue Fan-tastic pj pants! So excited for the sale tomorrow! I am a senior in college going into my last semester as well and am in the process of staring my own blog. I would love to have the pajamas in Shell of a Time! Thank you for this super adorable giveaway!! I cannot wait for the sale tomorrow. I really love the pajama pants in Sparkling Blue Fan-tastic! Hello Dorothy, thanks so much for hosting this giveaway! I am so excited for the sale and I absolutely love the PJs in Sparkling Blue Fan-Tastic! Enjoy the rest of winter break & good luck next semester. The Giveaway is the cutest ever! I love the Sparkling Blue Fan-tastic printed pants and am so excited about the sale!! I absolutely love your YouTube channel! I adore the Multi palm beach coral print! Great advice! I would love multi shell of a time pajama pants. My instagram name is heyjude808. My email is copleyjudi@yahoo.com. Best of luck with your senior year! Looking forward to the sale tomorrow! Thanks so much for the giveaway! My favorite print is Sparkling Blue Fan-tastic! My instagram is @cowgirljfa and my email is joanna dot f dot alper at vanderbilt dot edu. Thank you for the giveaway and the tips! I've never shopped the sale before and it helped me feel ready to go. If this giveaway is open internationally I would like to enter. I really enjoy reading your blog Dorothy and I love your college advice since I have started college this year. My favourite print is Sparkling Blue Fan-tastic. I love the Sparkling Blue Fan-Tastic print pants! My instagram is aharvey38 and my email is aharvey38@gmail.com. I absolutely love following your page and reading your blog. I am so thankful you are hosting this giveaway! My favorite pj pants from Lilly are the Sparking Blue Fan-Tastics. My insyagram name is allanaoshields and my email is calioshields@gmail.com. Thanks again. I'm sure whoever wins this giveaway will absolutely love all of these little goodies! Thanks for sharing your awesome tips and for hosting a fabulous giveaway!! Love the multi palm beach coral pj pants! Hey Dorothy! These are awesome tips. I haven't been able to collect a lot of Lilly stuff (I live in the northwest so it's really not available in stores which is so sad) but I'm trying to grow my collection! I love the Sparkling Blue Fan-tastic pj pants, they've been on my wishlist for a long time!! My Instagram is @lindsayabooyah and my email is lindsay.abuyan@gmail.com. I love your blog and love SO MUCH that you have been vlogging lately!! Love these tips, Dorothy! Thanks for the giveaway, I love the Sparkling Blue Fantastic pajamas! My instagram is @hannahstastny and my email is hannahstastny@yahoo.com. My favorite print in the pajama pants is sparkling blue fan-tastic! Love the Multi Palm Beach Coral pajamas! Thank you for hosting this giveaway! The Sparkling Blue Fan-tastic pajama pants are my favorite! My Instagram is @lindsayburgess_ and my email is burgesslindsay25@gmail.com. Hi Dorothy! This is such an awesome giveaway! I am in LOVE with the Shell of a Time print! Hey! I have been reading your blog for forever and love that you are so generous. I LOVE the Sparkling Blue Fan-tastic pants! Thank you so much for hosting a giveaway, it is so sweet you! I really like the Sparkling Blue Fan-tastic pajama pants! Lovee this giveaway as much as I love the Sparkling Blue Fan-Tastic Pajama Bottoms! My instagram is @rileymcnichols and my email is r.mcnichols@aol.com! Great advice for the sale. Also, thank you so much for having this awesome giveaway!! I love "Sparkling Blue Fan-Tastic" pajama pant. This is going to be my first time shopping the Lily sale so thank you for such wonderful tips!! My favorite of the pajama pants are the multi palm beach coral although I honestly love all of the patterns! Thanks for the adorable giveaway! Thank you so, so much for hosting such a great giveaway!! I absolutely love all of these items. My favorite print of the pajama pants is the "Sparkling Blue Fan-tastic" print. I love the Multi Palm Beach Coral pants- I think I would wear them all year long to remind me of my happy place :) Instagram: @taylorbartik and email: taylorbartik@gmail.com Thanks! This is such a generous giveaway! I like any of the of the prints of the Pj pants but LOVE Multi Shell Of A Time ones! This is such a fun giveaway! I love the Palm Beach Coral Pants! Thank you so much for doing this giveaway! I would be so grateful and blessed to win but I know you can only choose one! I hope you have a great 2017 and good luck on your last semester at Furman! I would love to receive the Multi Palm Beach Coral print because they are beautiful! Thanks for doing this giveaway! everything looks so cute! Oh my goodness, what a nice giveaway! I love the Multi Palm Beach Coral print, it is gorgeous! Also, the Pom Pom pouch is adorable!! Thanks for holding this giveaway! I love the pajama pants in Blue Fan-tastic, so cute! My instagram is @chicincarolina and my email is chicincarolina@Gmail.com! Hope you snagged some goodies in the sale today! Such cute pajama pants! I like the print Multi Palm Beach Coral. My insta name is @jademaryn and my email is jademaryn@gmail.com. Thanks for doing such fun giveaways! Such a fun giveaway! I love the pants in Multi Palm Beach Coral! My insta is @maggie.porter and my email is maggie.porter1@att.net. Love reading your blog!! Hey girly, this is so awesone of you for spreading the Lilly love! Happy Shopping! I love that you're doing a giveaway!!! I've been following your blog and YouTube channel for a few years now and I really enjoy your vlogs!!!!! I actually learned how to dress more preppy from your blog :) my favourite Pajamas are the Sparkling Blue Fan-Tastic Pajamas!!!! (Size small) My Instagram handle is @sabrina_sethi and my email is sabrinasethi33@gmail.com !! I would have forgotten about the Lily sale had it not been for your post. Thank you! I do love the cute jammie bottoms. The multi palm beach coral print would be my favorite. Thank you so much for a super cute giveaway and for the helpful tips and tricks for shopping the sale! My favorite print is Multi Palm Beach Coral, but i love all of them too! My email is laurenbonney10@outlook.com and my Instagram is Lauren_elizabth1344 Thanks again for an amazing opportunity to win some great items! Hey Dorothy! I'd love the Multi Palm Beach Coral. My Instagram is @hann.anderson and my email is hannahhanderson@gmail.com. Thanks so much for this giveaway, I truly couldn't be more excited! Love this giveaway! I would love the print Sparkling Blue Fan-Tastic! My Instagram name is kimmiecbar, and my email is kimberlybarrett15@gmail.com. Thanks for the sale tips! This is such a nice giveaway. My favorite print is the Sparkling Blue Fan-Tastic. My Instagram name is abigail_pore, and my email is pore.abigail@gmail.com. Thank you for the tips and all of your inspiration! Thanks so much for this awesome giveaway! My favorite print is Multi Palm Beach Coral, I love how it's so bright and fun! My instagram is @maggiegracceee and my email is maggieforehand2001@gmail.com. Thanks for the tips and the great giveaway! Lilly Sale day is always a little stressful (and fun too)! My favorite pajamas pants are Multi Shell Of A Time :). Who doesn't love shells. Thank you for the awesome giveaway! I love the Sparkling Blue Fan-Tastic Print. I think the print shell of a time is super great for these pajama pants! My favorite print sparkling blue fan-tastic. I love your blog and am so excited for the giveaway! I adore the pj pants in the Sparkling Blue Fan-Tastic print! Love your blog! Been following since you were a freshman, it's so hard to believe you're already a senior! My favorite of the pajama prints is Sparkling Blue Fan-Tastic! My Instagram is @theginnybethblog and my email is theginnybethblog@gmail.com. Thank you for hosting such a fun giveaway! Love ya! Thank you for hosting the giveaway! I hope you scored some fab Lilly this week. I love the Multi Shell of a Time pajama pants.